Husband. Father. Economist. Supporter of Native Oregon Beer. Well, it’s official. Dempsey is a Sounder. Man, that irks me so much. However I was much more pissed off before I heard the numbers. $9 million transfer fee and $8 million per year. Wow. That’s a lot of money. Especially for our league with a salary cap around $3m and top DPs at $2.5m – Landon – or $3.8m – Henry. As a thought experiment and what-if scenario, I was wondering what it would take in terms of ticket prices at Jeld-Wen Field to pay for something like this. Obviously ticket prices aren’t the only way for the team to recoup the costs, but does make for an interesting and revealing analysis. The top line results? Now, how did I get these figures? I took the seating map of JWF, season ticket prices and average attendance figures. Finding an approximate distribution of seats within the stadium by price allows us to do the rest. When I did this a few times with a few tweaks here and there I kept coming back to per game ticket sales of between $500,000 and $600,000. I also remember seeing a quote from Paulson about how the Cal FC game cost him about half a million dollars because we lost and therefore did not get to host another Open Cup match. So I think we’re in the ballpark here in terms of ticket sales. 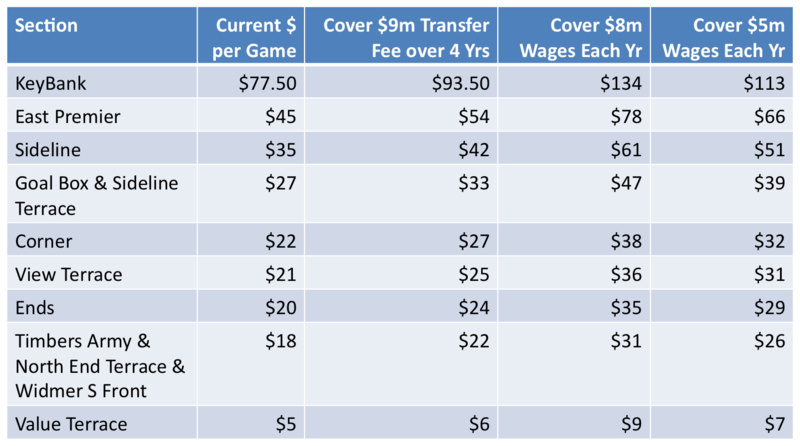 I ran the numbers at different levels of revenue to provide the range of estimates and then also under the three scenarios mentioned above: recouping just the transfer fee, paying the annual wages or paying part of the wages plus assuming more sponsors and merchandise. What those percentages mean is that for a TA ticket, recouping the transfer fee would amount to +$4 per ticket, or $80 over the 20 game season ticket package. For KeyBank that amounts to $16 per ticket or $320 per season. Over 4 years, these increases would amount to $9m. Where the math really starts to get ugly is when trying to pay for the annual salary for Deuce. $8m would require tickets to increase in price by 69-77%. A TA ticket would then cost $31 per match, an increase of $13 or $260 over the season. For KeyBank this amounts to +$56 per match, or $1,130 over the season. I don’t know how many Voodoo Donuts you would need to eat at $134 per match, but it’s a lot. Finally, assuming increased sponsorships and merchandise sales help cover the cost and the team only needs to recoup about $5m in annual wages, results in ticket price increases of somewhere between 43 and 48%. For a TA ticket this is +$8 per match, resulting in a $26 ticket. KeyBank would see increases of about $35 per match. All of the specifics across all ticket sections are below. Apologies for the small size, click on it for better viewing. Now, the question becomes whether or not these increases would be worth it. Seeing one of the best Americans to ever play the game is certainly worth something and I’d gladly pay more. I just don’t know what the fine line is in terms of being able to afford it as a team or not. Gains of 20% or so are likely manageable and with a waiting list like the Timbers have, certainly understandable. Now, trying to recoup both the transfer fee and a majority of the wage bill would likely be a bit too much, in my opinion.